Powell River & District United Way believes every person should have access to basic personal hygiene supplies. In November 2017, we launched the Hygiene Cupboard project as a part of our Healthy Families program. On Giving Tuesday (November 28th) we collected a fantastic amount of supplies for the cupboard from generous friends and supporters to kick start the project. ​ The Hygiene Cupboard is housed at the Community Resource Centre (CRC) and since December 2017 products have been available for anyone in need of hygiene items. We will gratefully continue to accept donations for the project at our office, throughout the year, and on an ongoing basis. The need doesn't stop and neither do we! The campaign to stock the cupboard last year was so successful that this year we are only asking for the items that we are running low on stock, such as: dental floss, toothpaste, deodorant/antiperspirant, shaving cream, and tampons/pads. Help us fill the cupboards for 2019! ​The Hygiene Cupboard is currently stocked with: toothpaste, mouthwash, dental floss, toothbrushes, bar soap, razors, shampoo, conditioner, nail clippers, brushes, combs, deodorant, pads, tampons, and shaving cream. NEW! 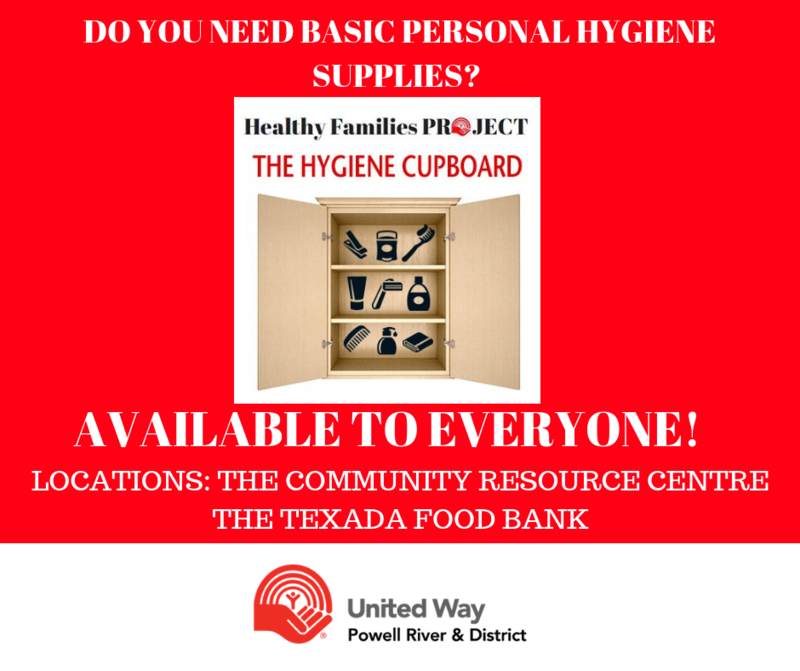 The Hygiene Cupboard is now also available at the Texada Food Bank.